We can grind your tree stumps to allow for replanting of new trees or prepare the area for grass planting. This process chips away the existing stump to a depth of up to 22 inches. This service is provided with minimal impact to your lawn and landscape. 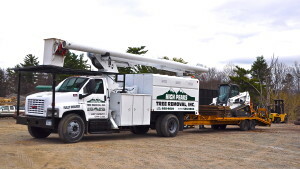 A standard prune job will include removal of dead and dying branches, crossing or interfering branches, hazardous or weak branches, as well as, selective thinning and reduction of branches protruding well above the main canopy of the tree. 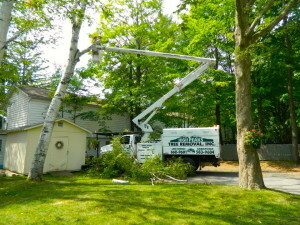 Utility wires and house/structure clearance are also included. All debris is chipped on site with a large capacity chipper and hauled away. Our crew’s clean up is unsurpassed, first raking and then blowing hard surfaces thoroughly so you never even knew we were there. Cabling and Brace Rod Installation. In the forest it is reasonable to expect that trees will fall apart over time or meet their demise by a lightning strike. This however is not acceptable or desired for trees growing in a rural or urban environment. Fortunately there are solutions that allow us to hold onto our prized trees for longer than might be expected otherwise. Cables, guying systems, and brace rods can help support weakened limbs, trees, and/or branch unions. Chipping is an excellent option for debris removal— more economical than hauling and safer than burning. An added bonus is that our customers have the option of using the resulting chips for mulch, landscape bark or even for dust and erosion control, if so desired. 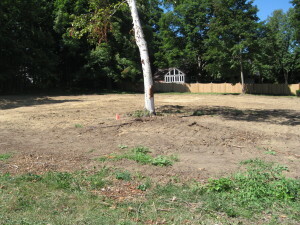 Lot and land clearing are some of the first steps for a landowner to take in order to develop their lot. 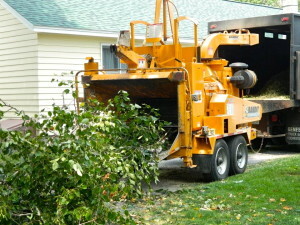 With the help of High Peaks Tree Removal, your lot will be cleared quickly, efficiently, and cost effectively. Some trees are so dangerous and difficult to fell that a crane must be brought in to help safely remove them. 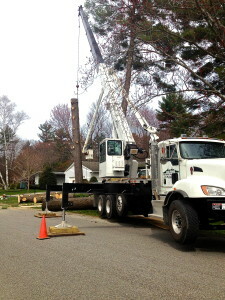 High Peaks Tree Removal offer’s a crane for hire on all types of projects. From new-build construction to delicate lifts, our staff of highly qualified and trained operators will make your next project safe and affordable. We are experienced owner/operators of bobcat skid steers both small and large. If you have a task around the home or job sites that require some heavy lifting or need an extended reach. Log Length. Call Us for availability.